Boy Bear Coming Home Outfit by TheSouthernCloset101 at Nicky's Blog. Hurry! Limited time offer. Offer valid only while supplies last. 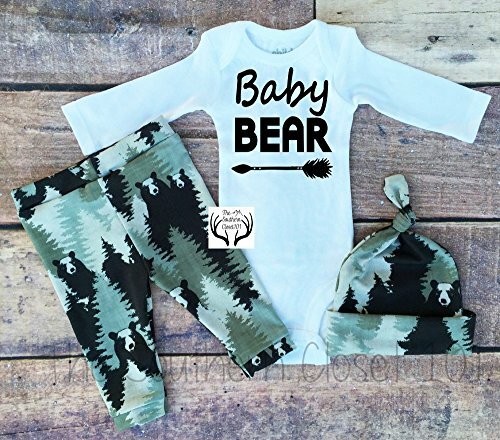 --WORDS ON BODYSUIT, Baby Bear, COLORS OF FABRIC, Black,Dark Green and Lighter Green. THIS LISTING IS FOR, 1 BODYSUIT 1 PAIR OF LEGGINGS 1 HAT. If you have any questions about this product by TheSouthernCloset101, contact us by completing and submitting the form below. If you are looking for a specif part number, please include it with your message.